IS YOUR RADIO SYSTEM FULLY COMPLIANT? 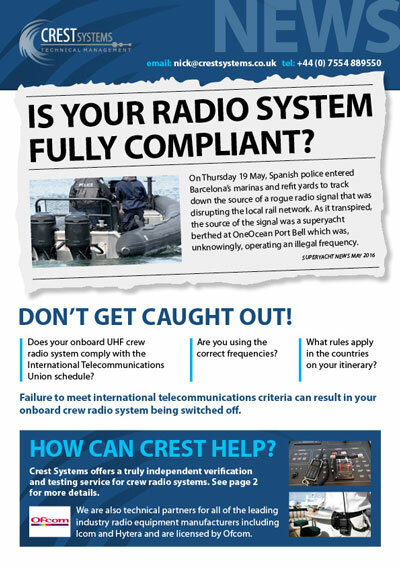 Does your onboard UHF crew radio system comply with the International Telecommunications Union schedule? Are you using the correct frequencies? What rules apply in the countries on your itinerary? Failure to meet international telecommunications criteria can result in your onboard crew radio system being switched off. Click here to find out more and to see how Crest can help. © Copyright 2015. Crest Systems Engineering Ltd. All rights reserved.